There are several options to pay your MRV visa fees- by cash at NIBL bank, ATM, or by Online. Each of these options is paid within our online applicant system. In order to ensure the proper amount is paid and activated in a timely manner, first create a profile here and choose the Schedule Appointment option. On the payment confirmation screen you will be presented with payment options and further details of how to initiate payment. Note: it can take up to 1 business day from the time of payment for your receipt to be activated. . If you are paying for a group of applicants visit the group appointment page. Log-in to our online applicant system and create a profile. This will ensure the proper amount is paid and activated in timely manner. Values are shown in U.S. Dollars (USD); however the Fee payable is in Nepali rupee (NPR). This page has more information about the different visa application fees. Once you are on the Payment screen, click on Payment Options. Review the Cash at Bank section for further details. The NPR amounts are based on the consular currency exchange rate determined by the U.S. Department of State. Applicants who do not pay the correct fee for their visa type may be restricted from scheduling an interview. Pay the visa fee. When you pay the visa fee, you acknowledge that this is a non-refundable visa application processing fee required as a prerequisite to the processing of an application. It does not indicate the existence of a contract with the applicant, nor does it guarantee a successful application. There is no refund possible regardless of the outcome of this application. Save the bank receipt for your records. It cannot be replaced if it is lost. 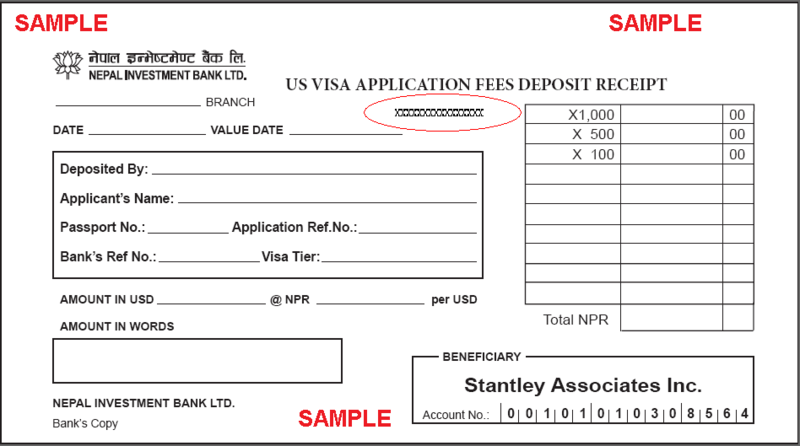 You will need the receipt number on the bank receipt to schedule your visa appointment. Once you pay your visa fee, you can schedule your interview after 11:00am the next business day. Log-in to your profile and complete the Schedule Your Appointment steps with your receipt number. You can pay your nonimmigrant visa (NIV) application fee in cash at any NIBL Bank branch. Cheques are not accepted. You must bring your passport for identification purposes to make your payment. Before going to the bank you must print and carry the applicable U.S. visa deposit slips (available after logging into your profile). Do not print multiple copies of the same deposit slip. If you print a deposit slip in advance of the day in which you plan to make your payment, take note of the expiration date on the deposit slip. If the expiration date passes prior to using the slip to make your payment, simply return to the website and click the appropriate link to generate a new deposit slip. NIBL Bank will NOT accept payments based on expired deposit slips. Take the deposit slip to the bank when you pay your fee. Cheques are not accepted. You must bring your passport for identification purposes to make your payment. Be sure that you pay the exact amount indicated on the deposit slip. After receiving your payment, the cashier will give you a receipt. Save the bank receipt for your records. It cannot be replaced if it is lost. You will need the receipt number on the bank receipt to schedule your visa appointment. You may pay your MRV Fee using the popular and convenient online payment system. You may pay your nonimmigrant visa application fee with a eBanking transfer directly from your bank account, if you have an existing account in Nepal Investment Bank limited. After logging into your profile and while on the payment confirmation screen, you will receive a unique account number to which you will send the NEFT payment. Please make only one payment per unique account number as the payment is non-refundable. IT IS CRITICAL THAT YOU KEEP THE UNIQUE ACCOUNT NUMBER THAT YOU ACTUALLY USE TO MAKE YOUR NEFT PAYMENT. You must have this number as proof of payment in order to schedule your visa interview appointment. It is the applicant's responsibility to save this number. If not, you may not be able to schedule an interview with your payment. 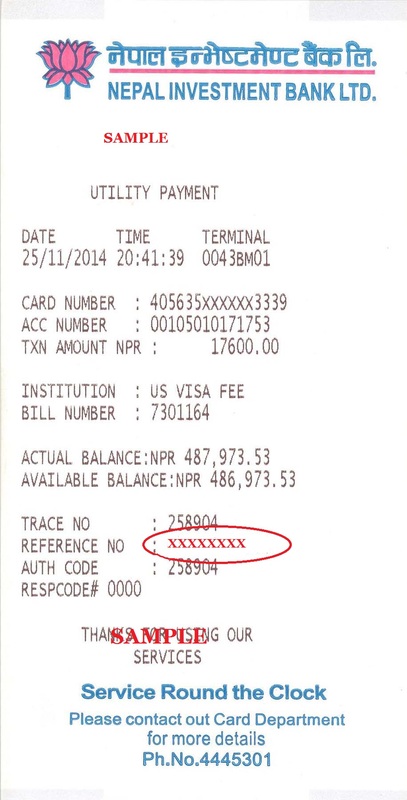 You can pay your nonimmigrant visa (NIV) application fee at any one of the 79 ATMs of NIBL spread across Nepal. Before going to the ATM, you must create a profile in our online system and print the Deposit Slip. At the ATM, you will enter your card details, choose ‘Other Services’, and you will choose the ‘Bill Payment’ option. Once this option is chosen, then you must choose ‘US Visa Fee’ as a payment option, where you will be asked to enter the Ref. no.. After entering the CGI ref. no. in reference no. field, applicant will be required to enter the correct visa fees amount as mentioned in the Deposit Slip. Be sure that you enter the exact amount indicated on the printed Deposit slip. On completion of a successful payment, you will be issued a receipt containing the unique ‘Reference No.’ which you must retain and use to complete the appointment scheduling process either online or through the service center. Whether you schedule your appointment online or contact our call center, you will need the receipt number printed on your bank receipt. See the example below circled in red. Example: If you pay on Monday before 5pm, your receipt will be activated after 11am on Tuesday. Example: If you pay on Monday after 5pm, your receipt will be activated after 11am on Wednesday.